Oiled bird in coastal habitat. This is a job aid designed for anyone who needs to decide if, where, when, and how to remove oil from coastal habitats. 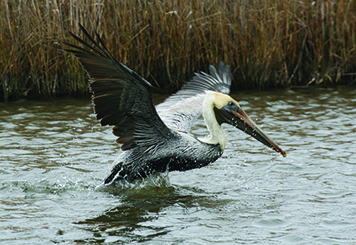 It illustrates typical attributes of North American coastal habitats at risk from oil spills. The text describes each habitat and discusses how oil is likely to behave there, and considerations for treating oil. The guide is especially useful for people participating in cleanup assessment as part of an Environmental Unit within the Incident Command System (ICS). This job aid is available in English and Spanish. Characteristic Coastal Habitats: Choosing Spill Response Alternatives [PDF, 5.1 MB]: Updated in June 2010; reprinted in March 2017. Hábitats Costeros Característicos: Selección de Alternativas para Responder a Derrames de Petróleo [PDF, 3.8 MB]: In Spanish, published in 2001. This guide and its companion guide, Characteristics of Response Strategies: A Guide for Spill Response Planning in Marine Environments, are based on information contained in the manual, Environmental Considerations for Marine Oil Spill Response, published in 2001 by the American Petroleum Institute, NOAA, the U.S. Coast Guard, and the U.S. Environmental Protection Agency. The manual is available for purchase from IHS Inc.